This Post has already been read 1285 times. PTA has directed all telecom operators o immediately stop all prize schemes, even if they are legitimate, or operators will have to face legal action from PTA in accordance with law. 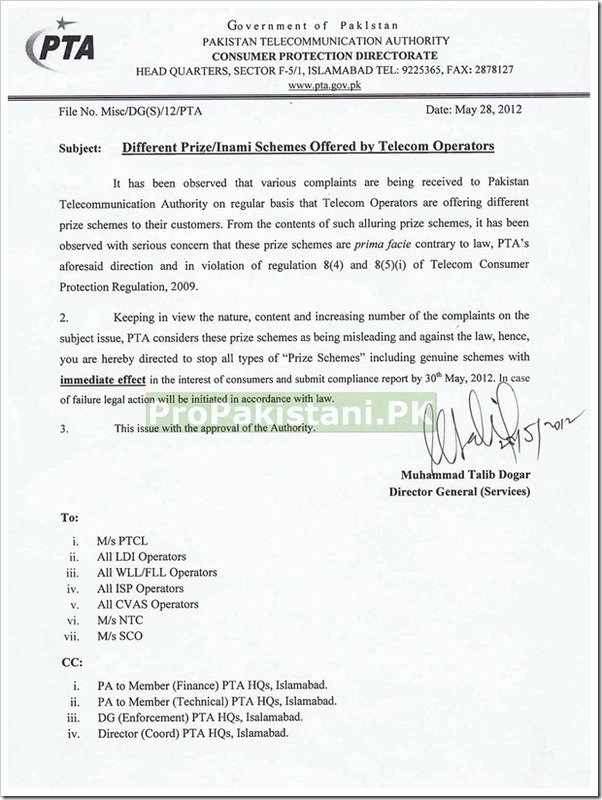 A letter from PTA to all telecom service providers dated 28th may, 2012, read that authority regularly receives companions from customers regarding the Inami Schemes that various telecom operators have been offering. PTA termed these prize schemes as misleading and against Telecom consumer Protection Regulation and hence directed all telecom operators to stop such offerings with immediate effect to avoid any legal action. Inami Schemes or Lucky Draws are considered a lucrative revenue inflow for telecom operators. Industry sources suggest that one such scheme earns PKR 4 to 5 million for a telecom operator per day or PKR 150 million a month. However, such schemes are usually misleading and result into loss of valuable money for telecom customers. These prize schemes, officially announced and advertised by telecom operators, give an opportunity to fraudulent people to fake the scheme and earn money through illegal means. PTA has asked telecom operators to submit their compliance report in two days.